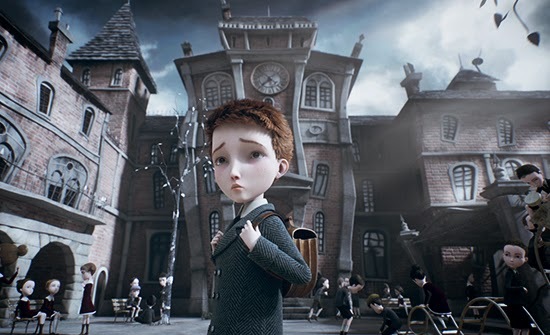 Jack and the Cuckoo Clock Heart (2013) begins with a terrible blizzard as a mother seeks shelter from the cold, trying to keep her unborn baby safe. She finds a house on a hill, birds freeze, die, and fall from the air as she makes her way up. Eventually, the mother decides to leave the fate of her child to the mistress of the house, and leaves. Jack grows into a curious young man. His mother warns that he must follow three simple rules: never touch the hands of your clock, keep your temper under control, and never, ever fall in love. He eventually meets an adorable young girl, named Miss Acacia, singing on the street. He shares a wondrous musical duet with her, and she promptly vanishes from Jack's life, changing his perspective forever. The designs are really well done. I love the Gothic touch, the swirls, and the big heads. It reminded me of Mark Ryden's artwork, and he's one of my favorite artists! The cityscapes were also visually appealing, and the overall aesthetic was great. Loved the muted tones. 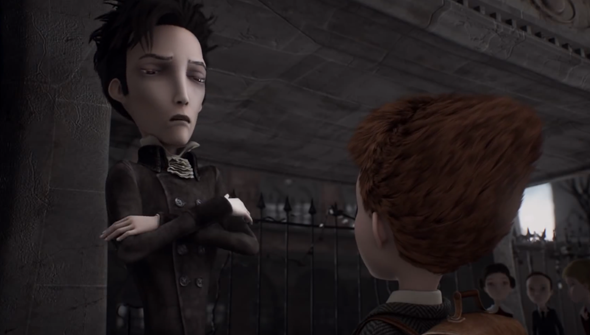 It had a Tim Burton-esque vibe, with a stop-motion feel to the animation. The ending was really appreciated. I won't spoil it, or say how it ended, but I'm glad that it ended the way it did. By the way the story was unfolding I did think it was going to conclude differently. So glad it didn't. 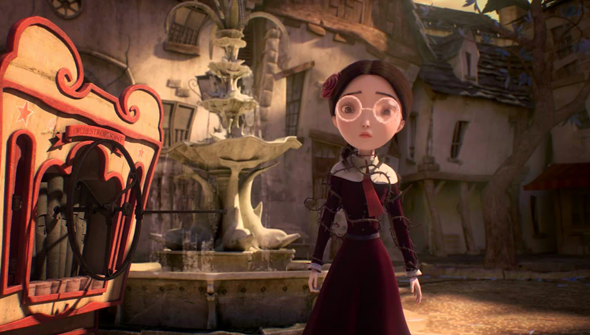 While wonderful to look at, visually, the animation itself was really twitchy. Not sure if it was intentional, but it was jarring to watch. Every movement was quick, sketchy, and didn't really have any life to them. They were like puppets on screen with little to no emotion. Yes, they did emote, but everything about the performances felt cold, and devoid of any kind of life. Music in Jack and the Cuckoo Clock Heart was all right, but very forgettable. A lot of it felt out of place, and it just didn't sit too well every time the characters sang. Also, the first song sung between Jack and Miss Acacia was really awkward. I mean, the words and the exchange. Did he just say "I want to tear your clothes into confetti with my teeth?" Wow. And the fact that this one encounter sets off the events of the entire story was also out of place, to me. Which brings me to the story. It was really fast. I didn't feel any build up or nuance to any of the characters or events. They'd say something, react, and then everything just seemed to happen? I didn't understand the motivation behind what anyone did, and by the end of the movie I still really didn't care. I mean, I get what was going on, but why? I was never rooting for Jack and Miss Acacia to get together. I didn't see any chemistry, or reason why they should end up as a couple. In the beginning, Jack is just pining over her, without knowing anything about Miss Acacia. It's all lust and no purpose. He also comes off as a bit of a creeper, and goes into full tilt stalker territory as the movie progresses. Then, when they finally meet face to face, it doesn't get any better. It's strange, awkward, and when she inevitably turns on him, I was just like let her leave! They were both unlikable. End it. There was no love story, just foolishness. I was really excited when I first heard about this movie. I really wanted to love it, but I just wasn't a fan. When the Miss Acacia fairy came out and started dancing to the music, I was pretty much done with Jack and the Cuckoo Clock Heart. While I enjoyed the designs and the ending was much appreciated, that's all I really took from the movie. Something about the animation and its fluidity seemed off, the characters lacked emotion, performances were stiff, the story felt like it moved too fast, and I didn't enjoy the musical numbers. I will say that it was interesting, and had a lot of promise, but I probably wouldn't watch it again.